My new toy. Love it. Well, I haven't visited foodandbooksandstuff for a while. I missed it. Daily life sometimes takes over. Yesterday, I popped over to the neighbor's garage sale. I'd never met this neighbor, two doors down, as they don't spend a lot of time out of doors. Interestingly, my neighbor was someone who had volunteered for an area I coordinated at the Salem Art Fair this last July. Interestingly, one of my last blog posts was during the Salem Art Fair. Interesting or cosmic weirdness? The neighbor and I chatted and laughed about the coincidence. Then I spotted it. 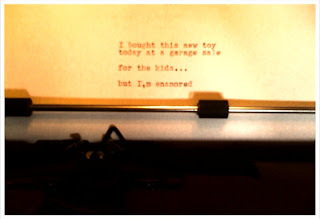 I'd been looking for an old typewriter at the urging of my youngest but was always put off by the expense of the wonderful machines. But, there, on the other side of the driveway, hidden behind some recording devices of old, was the tell tale carrying case of a vintage portable typewriter. The neighbor's husband explained it had been his brother's while in college and was passed along to him. It's been sitting, waiting, for me. I don't know how old it is. 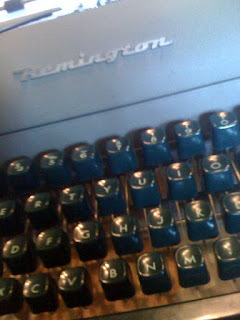 My brief foray into research on the brand - Remington Rand - suggests that it is unlikely to have been made post 1955. My other spoils from the garage sale include: Records; Orson Welles' "The War of the Worlds," a Tom Jones album for my pal Trice, two "Remember the Golden Days of Radio," which include vintage radio broadcasts, from comedy to news, and finally Roberta Flack's "Killing Me Softly." I also bought a grab bag of vintage office supplies which included an old stapler, a single hole punch and a Cross pen. All in all a lovely haul.